westdrift’s signature restaurant is an an indoor-outdoor enclave with a fresh, creative and communal-focused dining experience. A future stay at westdrift may include a variety of exciting new adventures including cocktail tastings with expert mixologists, a backyard round of golf, and exploring neighborhoods by beach cruisers. Plug-in or unplug, kick-back or turn-it-up – the choice is yours. 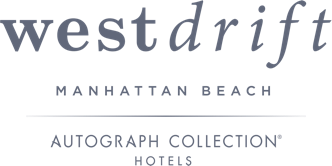 westdrift Manhattan Beach features 393 luxury guest rooms that mix California cool with East Coast sophistication.